UK / 77 minutes / bw / Elvey-Gartside, Romulus, Independent Film Distributors Dir: Maurice Elvey Pr: Ernest Gartside Scr: Charles Frank, David Evans Story: The Late Edwina Black (1950 play) by Wm. Dinner and Wm. 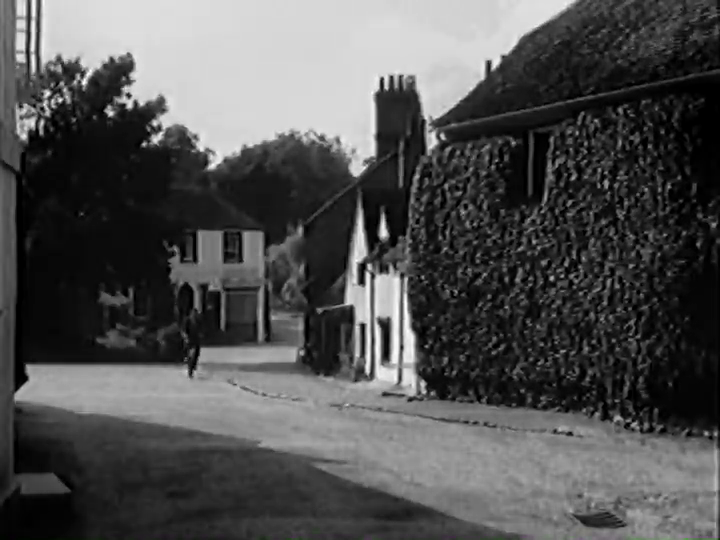 Morum (i.e., William Dinnie and William Murum) Cine: Stephen Dade Cast: Geraldine Fitzgerald, David Farrar, Roland Culver, Jean Cadell, Mary Merrall, Harcourt Williams, Charles Heslop, Ronald Adam. 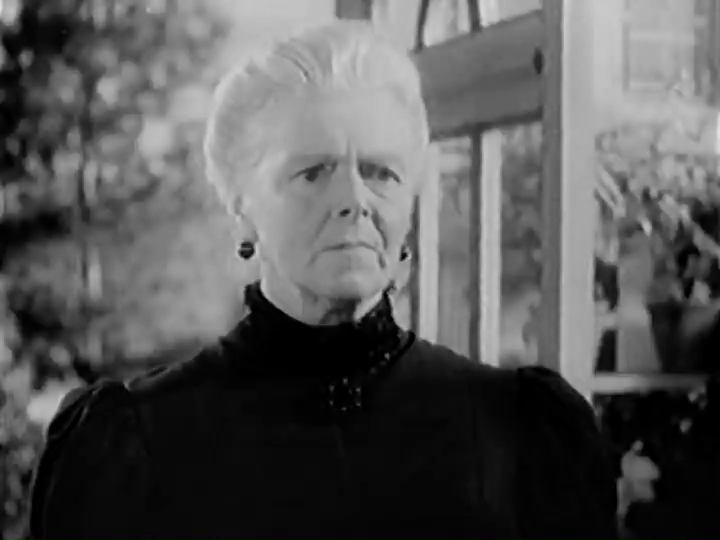 Also at the funeral, the quirky Lady Southdale (Merrall) explains to the dead woman’s companion, Elizabeth Grahame (Fitzgerald), that Elizabeth can’t stay on any longer at the Black mansion without village tongues beginning to wag. Elizabeth was rescued from immense poverty years ago by Lady Southdale, who found her the job with the Blacks. Now Lady Southdale offers to employ Elizabeth. But Elizabeth tells her that now is not the moment to desert Gregory. 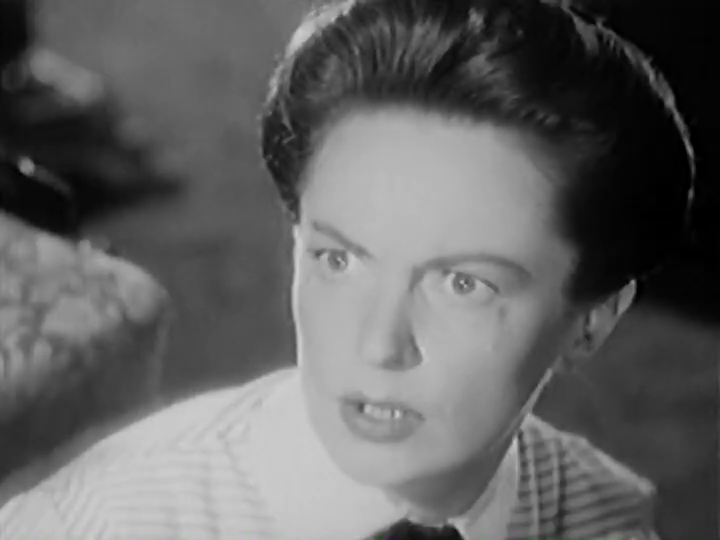 Ellen (Jean Cadell), ever frosty toward Elizabeth and Gregory. As soon as the guests have gone, we discover that, if only the village knew what was going on, those tongues would indeed wag. Gregory and Elizabeth have been in love more or less since they first laid eyes on each other and, although it seems the love is unconsummated, their hope now is to marry as soon as possible. Elizabeth wants to get away from the house immediately, and they decide to set out for Venice on the morrow to spend a honeymoon there—indeed, Elizabeth has dreamed so much of being in Venice with Gregory that a few weeks ago she even sent off for a tourist brochure about the city. The lovers are free at last: Geraldine Fitzgerald as Elizabeth and David Farrar as Gregory. 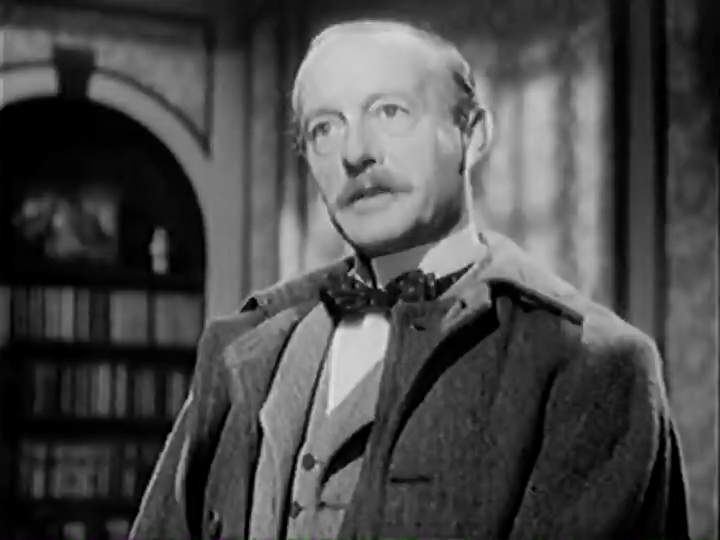 Next day, though, as their cab waits to take them to the station, Inspector Martin (Culver) of the Yard arrives at the house to say that Dr. Prendergast has had second thoughts about the death certificate. A post mortem reveals arsenic in Edwina’s body. Who could have poisoned her aside from the other three occupants of the house—Elizabeth, Gregory and Ellen? Since Ellen was devoted to her mistress—and reviles Gregory and Elizabeth for, as she sees it, having tormented Edwina in her last months of life—she seems an unlikely suspect, so that leaves just the two lovers. Inspector Martin of the Yard (Roland Culver). Elizabeth is convinced that the malevolent spirit of Edwina still infests the house: “It isn’t us. It’s this house. It’s full of her. Everything in it comes between us. If only we could stop that.” At appropriate moments a little set of wind chimes that Edwina loved tinkles in what, Elizabeth fancies, is an imitation of Edwina’s cruel laughter. Gregory doesn’t go along with that, but he too feels as if somehow Edwina’s mocking them from beyond the grave (“So Edwina has won after all,” he says in a moment when his and Elizabeth’s love seems to lie in ruins). And both of the lovers are troubled by the fact that, well, the only possible suspect for the poisoning is the other. We too face this same uncertainty: while Gregory has a habit of telling unnecessary lies, which makes him seem the obvious culprit, Elizabeth had by far the better opportunity to administer the arsenic . . . The climax of suspicion comes, ironically, when Gregory pours them each a glass of port so that they can toast an end to all their suspicions—only for Elizabeth to take a hefty swallow and realize it tastes all . . . wrong. Has he poisoned her, too? What they don’t realize is that the port bottle was earlier in Edwina’s room and Edwina was in the habit of tipping the prescription medicine she loathed into the nearest available receptacle. There couldn’t possibly be anything wrong with the port . . . could there? 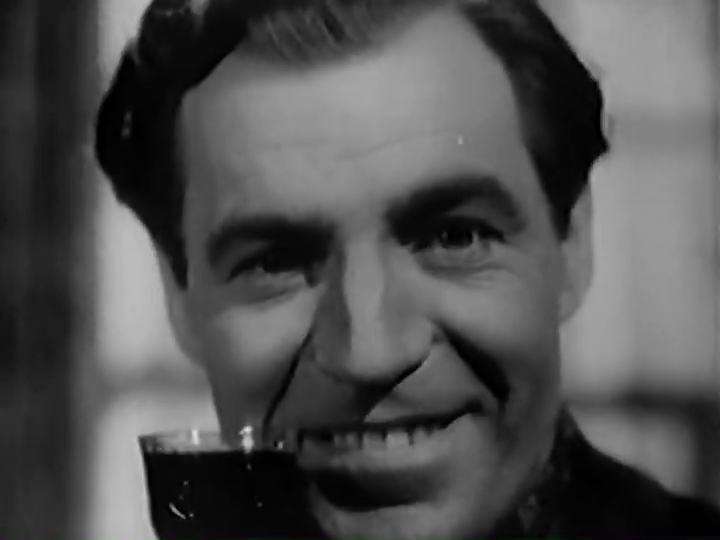 David Farrar as Gregory. For much of the time this is all very well handled, and sometimes with some subtlety. The information that the lovers have finally consummated their relationship is communicated solely by the way they smile at each other the next day (and perhaps a little softening of the focus). For a while we’re led up the garden path into thinking this is going to be a ghost story, or even a story of possession, because in some ways Elizabeth starts to behave a bit like we guess Edwina must have, accusing Gregory of parasitism and cowardice. But there are times when Elvey’s hand becomes less assured. The lurch into mutual suspicion and the mood swings of the two lovers as they go from wild accusations to reconciliation and back again are somewhat clumsily done, as if the movie could have used twenty more minutes of running time to build up these emotional climaxes properly. Yet this is to focus too much attention on what’s really a fairly minor failing. What the movie succeeds in doing is grabbing our attention in the opening moments and refusing to release us until it’s done. Here it’s helped by Dade’s wonderfully understated cinematography—at the time you’re hardly conscious of it, but afterwards you realize how effortlessly it made the narrative move forward—and by the performances of the central quartet . . . not to mention Merrall in her small part as the acerbic yet golden-hearted grande dame. Farrar is fine though nothing special here, but both Fitzgerald and Cadell deliver outstanding turns, only to be if anything outdone by Culver as the outwardly plodding copper who’s about three times as shrewd as the others, Elizabeth excepted, think he is. 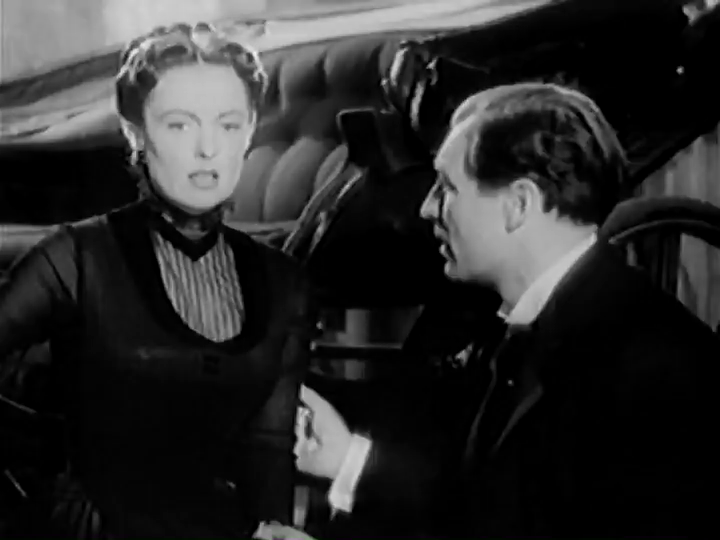 A moment when the suspicions Elizabeth (Geraldine Fitzgerald) harbors toward Gregory are at their height. The solution to the mystery? From the very (very) little I know about forensics, I’m not sure it really quite makes sense, but in terms of the story it’s appropriately clever and surprising. The date I give above for Dinnie and Murum’s play is the date of its book publication; I can’t find a date for its stage premiere. Since the publisher was Samuel French, it’s possible the play was issued with amateur dramatic societies and/or rep in mind—i.e., that it never had a professional premiere as such. Other screen adaptations of it have been The Late Edwina Black (1964 TVM Australia), with Anne Haddy, Ron Haddrick, Ethel Gabriel and John Gray, The Late Edwina Black (1964 TVM UK), and De Man Met de Paraplu (1968 TVM Belgium), dir Kris Betz, with Jeanne Geldof, François Bernard, Nora Oosterwijk and Gerard Vermeersch. This entry was posted in UK Borderline Noir and tagged Anne Haddy, Charles Heslop, David Farrar, De Man Met de Paraplu (1968 TVM), Ethel Gabriel, film noir, François Bernard, Geraldine Fitzgerald, Gerard Vermeersch, Harcourt Williams, Jean Cadell, Jeanne Geldof, John Gray, Kris Betz, Mary Merrall, Maurice Elvey, Nora Oosterwijk, Roland Culver, Ron Haddrick, Ronald Adam, The Late Edwina Black (1950 play), The Late Edwina Black (1952), The Late Edwina Black (1964 TVM), The Obsessed (1952), UK borderline noir, William Dinnie, William Murum. Bookmark the permalink. I’m a magnet for understated cinematography. Another one to look out for – thanks, John! Indeed! While I was posting the entry I was actually thinking to myself that this was one you might like. I hope you do! Surely must be later than Victorian, then, unless “taxi” refers to a horse-drawn cab. Good point! It’s horse-drawn. Maybe “cab” would have been a better choice of word. If the story is “clever and surprising” as you contend, it doesn’t have to make much sense. Another master class piece of writing here on another film beyond most people’s radar. It’s very surprising that this one is relatively little known, since the tale itself was obviously very popular at one time — to wit the remakes — and this adaptation of it is a pretty good one. It’s got a sort of Spiral Staircase feel to it. I though Farrar was amazing on BLACK NARCISSUS and SMALL BACK ROOM, so sorry to hear he doesn’t make much of an impression. 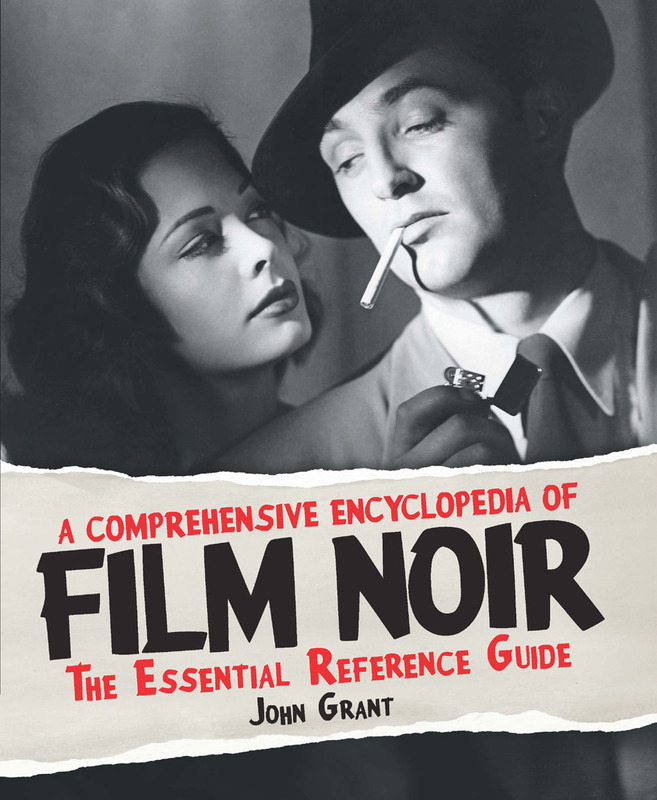 But then, Elvey while a veteran from the earliest days of British cinema, was no Michael Powell,. He’s by no means bad here; it’s just that the other principals are so very good.